Canonical Wnt signaling pathway. A: In the absence of Wnts, β-catenin forms a complex with Axin, APC, and GSK-3β; and it is degraded by the ubiquitin-proteasome system. 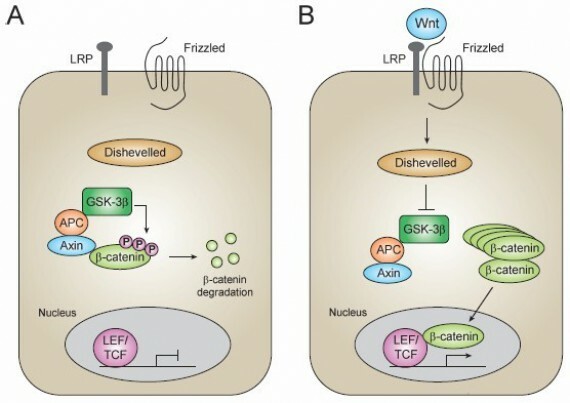 B: When Wnts bind their receptors, such as Frizzled and LRP, GSK-3β is inactivated via Dishevelled. Cytoplasmic β-catenin is stabilized and the accumulated β-catenin is translocated into the nucleus, resulting in the activation of the transcription factor, LEF /TCF. LRP, low-density lipoprotein receptor–related protein; APC, adenomatous polyposis coli; GSK-3β, glycogen synthase kinase-3β; LEF/TCF, lymphoid enhancer–binding factor/T-cell factor. Cell signaling cascades activated by Wnt proteins (i.e., the Wnt signaling pathways) are well conserved through evolutionary processes across a variety of species. In regulating cellular processes such as proliferation, differentiation, motility, and survival / apoptosis, the Wnt signaling pathways play key roles in embryonic development and maintenance of homeostasis in mature tissues . Of four known Wnt signaling pathways, [the Wnt/β-catenin (canonical) pathway, the planar cell polarity (PCP) pathway, the Wnt/Ca2+ pathway, the protein kinase A pathway], and the Wnt/β-catenin signaling pathway is best characterized . The activity of the Wnt/β-catenin signaling pathway is dependent on the amount of β-catenin in the cytoplasm. As described above, normally, the cytoplasmic β-catenin level is kept low through continuous ubiquitin-proteasome system–mediated degradation, which is regulated by a multi-protein complex containing axin, adenomatous polyposis coli (APC), and glycogen synthase kinase-3β (GSK-3β). The activity of GSK-3β is decreased by the phosphorylation of Ser9; several studies have shown that Ser9 in GSK-3β is phosphorylated by Akt, a serine/threonine kinase that is activated by phosphatidylinositol 3-kinase (PI3K), mitogen-activated protein kinase-activated protein kinase-1 (MAPKAPK1), a protein kinase downstream of the mitogen-activated protein kinase (MAPK) cascade, and p70 ribosomal S6 kinase-1 . Since several oncogenes are included amongst the target genes, constitutive activation of the Wnt/β-catenin signaling pathway can lead to cancer . One oncogene, the cyclin D1 gene CCND1, is a well-known Wnt/βcatenin target gene. The level of the cyclin D1 protein is regulated by an ubiquitin-dependent mechanism throughout the progression of the cell cycle. Cyclin D1 is transported from the nucleus to the cytoplasm where it is degraded by the 26S proteasome. Although GSK-3β is a cytosolic protein, it is translocated into the nucleus when activated and phosphorylates cyclin D1 on Thr286, thereby stimulating cyclin D1 turnover in response to mitogenic signals. Phosphorylation of cyclin D1 on Thr286 by GSK-3β facilitates its association with CRM1, which is a nuclear protein that mediates the nuclear export of proteins, resulting in the exclusion of cyclin D1 from the nucleus to initiate its proteasomal degradation . 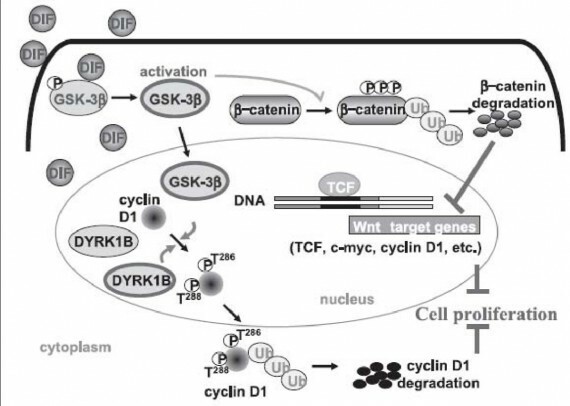 As described above, cyclin D1 gene expression is activated by Wnt/βcatenin signaling, in which GSK-3β plays a critical role in its regulation, and cyclin D1 protein degradation is regulated by GSK-3β. Thus activation of GSK-3β is expected to lead to a reduction in the level of cyclin D1 mRNA at the transcriptional level and the protein at the degradation level. While many diseases, including diabetes mellitus and Alzheimer’s disease, can be ameliorated by the use of GSK-3β inhibitors, cancers, especially those in which cyclin D1 is overexpressed, are likely to be more susceptible to pharmacological activation of GSK-3β. Differentiation-inducing factors (DIFs) were identified in Dictyostelium discoideum as the morphogens required for stalk cell differentiation . In the DIF family, DIF-1 [1-(3,5-dichloro-2,6-dihydroxy-4methoxyphenyl)-1-hexanone] was the first to be identified and DIF-3, the monochlorinated analog of DIF-1, is a natural metabolite of DIF-1 in Dictyostelium . However, the actions of DIFs are not limited to Dictyostelium. They also have strong effects on mammalian cells. DIF-1 and /or DIF-3 strongly inhibit proliferation and induce differentiation in several leukemia cells, including the murine erythroleukemia cell line B8, human leukemia cell line K562, and human myeloid leukemia cell line HL-60 . DIF-3 has been reported to have the most potent antiproliferative effect on mammalian leukemia cells among the DIF analog examined to date. However, the target molecule (receptor) of DIFs is unknown and it is not clear even in Dictyostelium how DIFs induce antiproliferative effects and cell differentiation. Although the precise mechanisms underlying their antiproliferative effects are not yet known, it has recently been found that DIFs (DIF-1 and DIF-3) inhibited mammalian cell proliferation by suppressing the expression of cyclin D1 mRNA and protein through the activation of GSK-3β . DIFs dephosphorylated Ser9 of GSK-3β by an unknown mechanism and thus activated this kinase. Activated GSK-3β by DIFs induced β-catenin degradation and suppressed β-catenin /TCF–dependent transcription activity, indicating that DIFs inhibit the Wnt /β-catenin signaling pathway (see Fig. 1). It also has been found that DIFs reduced the activity of a reporter gene driven by the human cyclin D1 promoter (+134/−961 bp) via a TCF binding site (−75/−81 bp) . This result suggests that DIFs inhibited cyclin D1 mRNA expression via the inhibition of β-catenin /TCF– dependent transcription activity. On the other hand, the activated GSK-3β translocates to the nucleus and phosphorylates cyclin D1 on Thr286 to trigger the degradation of cyclin D1 by an ubiquitin-dependent mechanism. Correlated with the above observations, DIFs induced G0/G1 cell cycle arrest, which was rescued by the overexpression of cyclin D1, suggesting that DIFs were likely to induce cell cycle arrest by reducing the expression of cyclin D1. also 288, according to previous reports . Zou et al. reported that dual-specificity tyrosine phosphorylation– regulated kinase 1B (DYRK1B), a member of the DYRK family, phosphorylates cyclin D1 on Thr288, also resulting in cyclin D1 degradation. Therefore, the effect of DIF-3 on DYRK1B was examined and it was found that not only GSK-3β but also DYRK1B was involved in the phosphorylation of cyclin D1 to trigger its degradation. This may have an important implication in DIFs-induced cyclin D1 degradation because DIFs induce rapid and strong degradation of cyclin D1 (within 1 h). Clarified DIFs action are summarized in Fig. 2. Thus, GSK-3β plays a critical role in the regulation of the amount of cyclin D1, as this kinase is involved in both cyclin D1 mRNA transcription and ubiquitin-dependent proteolysis. DIFs act as an inhibitor of the Wnt/β-catenin signaling pathway via the activation of GSK-3β, whereas the target molecule is not clarified. DIFs action and the Wnt/β-catenin signaling pathway. DIFs enter into the cell and dephosphorylate GSK-3β at Ser9 by unknown mechanisms, resulting in the activation of this kinase. Activated-GSK-3β translocates into nucleus and phosphorylates Thr286 of cyclin D1. DIFs also activated DYRK1B, which is present in nucleus, by an unknown mechanism, and activated DYRK1B phosphorylates Thr288 of cyclin D1. Phosphorylated cyclin D1 is exported from the nucleus, resulting in its degradation by the 26S proteasome system after ubiquitination. Activated-GSK-3β also phosphorylates β-catenin in the cytoplasm. Phosphorylated β-catenin is degraded, resulting in the inhibition of transcription of the target genes, such as cyclin D1 and c-myc. GSK-3β, glycogen synthase kinase-3β; DYRK1B, dual-specificity tyrosine phosphorylation-regulated kinase 1B; Ub, ubiquitin. have been well characterized . Recently, accumulating evidence suggests that GSK-3β is also critically involved in the fate of cells subjected to extracellular stress, including ischemia/reperfusion . GSK-3β has recently received attention as a possible regulator of mitochondrial permeability transition pore (mPTP) opening since this kinase is a common target of multiple signal pathways that lead to myocardial protection from infarction. In fact, myocardial infarct size is reduced by ischemic preconditioning and by treatment with δ-opioid, insulin, insulin-like growth factor, erythropoietin, or isoflurane; all of these interventions induce Ser9 phosphorylation of GSK-3β. However, different protein kinases (i.e., protein kinase C [PKC], Akt, ERK1/ 2) are responsible, depending on the intervention, for direct phosphorylation of GSK-3β in the cardioprotection. Evidence for a regulatory role of GSK3β in mPTP opening was first reported by Juhaszova et al. . They determined the threshold for opening of the mPTP by monitoring mitochondrial membrane potential in isolated cardiomyocytes and used ROS generated by laser irradiation as a trigger of mPTP opening. The threshold for mPTP opening was significantly elevated by inhibitory phosphorylation of GSK-3β at Ser9, transfection of a dominant negative mutant of GSK-3β, or reduction of GSK-3β expression by siRNA. Recently Gomez et al. assessed the involvement of GSK-3β in inhibition of mPTP opening by ischemic postconditioning. They isolated mitochondria from the myocardium after ischemia/reperfusion and determined the threshold for mPTP opening as the amount of loading Ca2+ required to induce irreversible Ca2+ release from the mitochondria. Post-conditioning significantly elevated the threshold of mPTP opening in cardiac mitochondria from wild-type mice, but such a protective effect was not detected in mitochondria from transgenic mice expressing GSKS9A, which cannot be inactivated by phosphorylation at Ser9. Taken together, these findings support the notion that phospho-GSK-3β regulates the threshold for mPTP opening in response to ROS and/or Ca2+ overloading. ischemia/reperfusion have been examined in isolated perfused rat hearts  to get an insight into the molecular mechanism by which phospho-GSK-3β regulates mPTP opening. Thus, GSK-3β was predominantly found in the cytosolic fraction under baseline conditions, but ischemia/reperfusion significantly increased GSK-3β level in the mitochondrial fraction. Reperfusion also increased phospho-GSK-3β level in all cell fractions. GSK-3β was co-immunoprecipitated with ANT and with VDAC before ischemia, but levels of these complexes were increased after reperfusion by approximately 50%, indicating that GSK-3β translocated after reperfusion binds to mPTP. hypothesized that elevation of the threshold for mPTP opening by phosphorylation of GSK-3β is achieved by direct interaction of phospho-GSK-3β with mPTP subunit proteins . To test this hypothesis, GSK-3β phosphorylation at Ser9 was induced by ischemic preconditioning and erythropoietin-receptor activation in rat hearts. Phospho-GSK3β in the reperfused myocardium was increased by preconditioning and erythropoietin-receptor activation in a PKC-dependent and Akt-dependent manner, and the increased phospho-GSK-3β was co-immunoprecipitated with ANT but not with VDAC. Furthermore, the level of CyP-D co-immunoprecipitated with ANT was significantly reduced to 40% in association with a 50% increase in phospho-GSK-3β ANT binding. These results suggest that interaction of phospho-GSK-3β with ANT inhibits CyP-D–ANT interaction, resulting in prevention of mPTP opening. In addition to ANT, p53 may be involved in suppression of mPTP opening by phosphorylation of GSK-3β. p53 is one of more than 20 substrates of GSK-3β, and its phosphorylation enhances functional activity and translocation of p53 to the nucleus and mitochondria . A recent study by Venkatapuram et al. showed that an inhibitor of p53, pifithrinα, lowered the threshold of isoflurane-induced limitation of infarct size in rabbit hearts. Interestingly, this beneficial effect of a p53 inhibitor was abolished by an activator of mPTP, atractyloside. Thus, inhibition of GSK-3β–mediated p53 phosphorylation may also contribute to suppression of myocardial necrosis by GSK-3β phosphorylation. more than one pathway is frequently activated by cardioprotective receptor agonists and ischemic preconditioning . However, some of the cytoprotective signal pathways suffer from impairment by concurrent diseases associated with coronary artery diseases (such as diabetes mellitus, hypercholesterolemia, and post-infarct ventricular remodeling). It has been found that post-infarct remodeling impairs activation of PKC-ε after ischemic preconditioning and Jak2–PI3K–Akt signaling by erythropoietin-receptor activation . Erythropoietin-receptor activation also failed to activate the Jak2–PI3K–Akt pathway in the myocardium of an animal model of type 2 diabetes . Thus, from the viewpoint of clinical application, a strategy to directly inhibit GSK-3β would be more preferable to indirect GSK-3β inhibition by use of its up-stream signaling pathways. cardiomyocytes from ischemia/reperfusion-induced necrosis. The mechanism of GSK-3β phosphorylation differs depending on the receptor activated by the intervention, but inactivation of GSK-3β by phosphorylation at Ser9 elevates the threshold for mPTP opening, which reduces myocyte necrosis. Although the mechanism by which phospho-Ser9-GSK-3β elevates the threshold for mPTP opening is unclear, suppression of ANT–CyP-D interaction by binding of phospho-Ser9-GSK-3β to ANT and reduction in GSK-3β–mediated phosphorylation of p53 may be involved. The level of phospho-Ser9-GSK-3β at the time of reperfusion is a determinant of infarct size, and GSK-3β inhibitors are promising as agents for myocardial salvage in patients with AMI. Summarizing these observations, it has become clear that there is a clinical need for novel therapy to protect cardiomyocytes from ischemia/reperfusion-induced necrosis. An advantage of a GSK-3β inhibitor for clinical use is its efficiency even when administered immediately before reperfusion. Another favorable profile of GSK-3β inhibitors is that their protective effect would not be impaired by common co-morbidities in AMI patients that modify signaling to cytoprotective kinases such as PKC-ε and Akt. Although chronic inhibition of GSK-3β raises concern about risks of cancer development and ventricular hypertrophy , such risks would be negligible for single injection of a GSK-3β inhibitor before reperfusion therapy in AMI patients. It has been found that GSK3β selectively interacts with 5-hydroxytryptamine-1B receptors (5-HT1BR) that have important functions in serotonin neurotransmission and behavior . Using molecular, biochemical, pharmacological, and behavioral approaches, authors tested 5-HT1BR’s interaction with G(i)α(2) and β-arrestin2 and 5-HT1BR-regulated signaling in cells, serotonin release in mouse cerebral cortical slices, and behaviors in wildtype and β-arrestin2 knockout mice. Molecular ablation of GSK3β and GSK3 inhibitors abolished serotonin-induced change of 5-HT1BR coupling to G(i)α(2) and associated signaling but had no effect on serotonin-induced recruitment of β-arrestin2 to 5-HT1BR. This effect is specific for 5-HT1BR because GSK3 inhibitors did not change the interaction between serotonin 1A receptors and G(i)α(2). Two GSK3 inhibitors, N-(4-methoxybenzyl)-N’-(5nitro-1,3-thiazol-2-yl)urea (AR-A014418) and 3-(5-bromo-1-methyl-1H-indol-3-yl)-4-(benzofuran-3-yl)pyrrole-2,5dione (BIP-135), efficiently abolished the inhibitory effect of the 5-HT1BR agonist anpirtoline on serotonin release in mouse cerebral cortical slices. suspension test but spared anpirtoline-induced locomotor activity. These results suggest that GSK3β is a functional selective modulator of 5-HT1BR-regulated signaling, and GSK3 inhibitors fine-tune the physiological and behavioral actions of 5-HT1BR. Future studies may elucidate the significant roles of GSK3 in serotonin neurotransmission and implications of GSK3 inhibitors as functional selective modulators of 5-HT1BR. 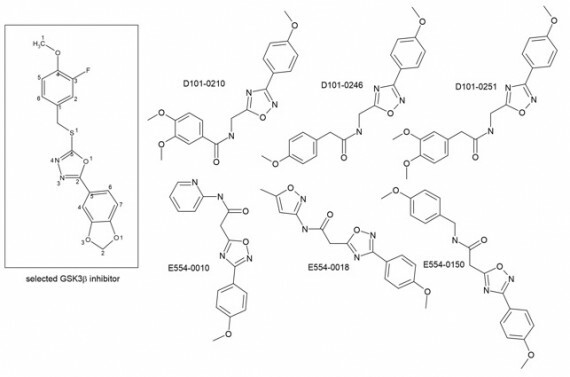 To date, more than 750 small-molecule compounds have been identified as potent GSK-3β inhibitors (Fig. 3). 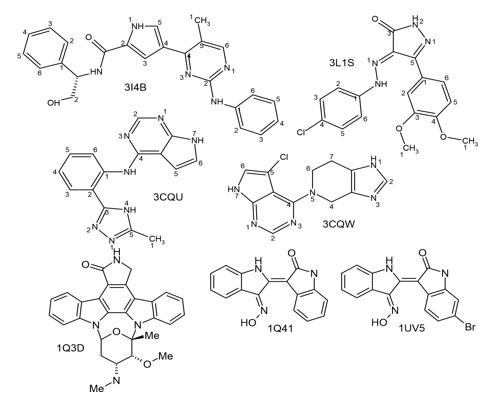 As shown in figure 3, compounds belong to a wide range of chemotypes with different features. 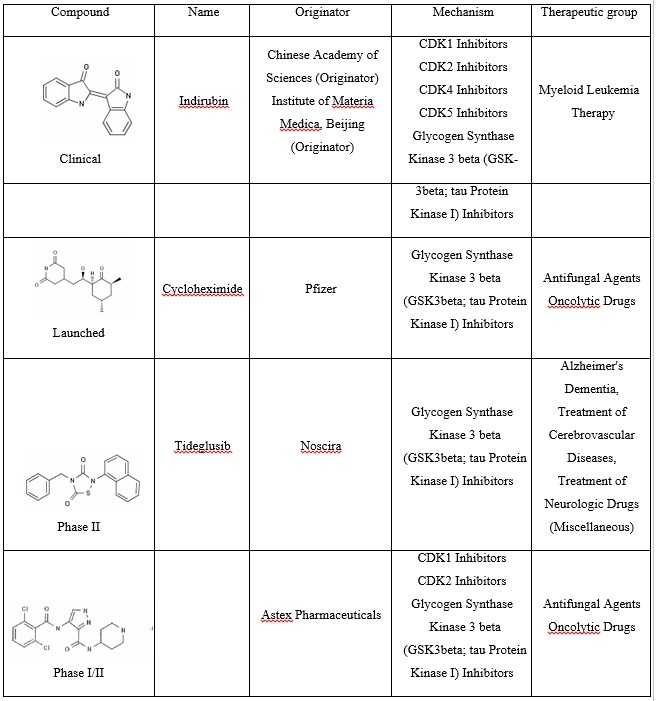 Among these compounds at least 7 agents are currently evaluated in advanced clinical trials (Table 1). Hundred papers dedicated to the synthesis of novel GSK-3β inhibitors have been published to date. Several recent examples are listed below. activity of bicyclic and tricyclic derivatives of the 5,7-diamino-6-fluoro-4-quinolone-3-carboxylic acid scaffold (Fig. 4A). Kinase selectivity profiling indicated that members of this class were potent and highly selective GSK-3 inhibitors. 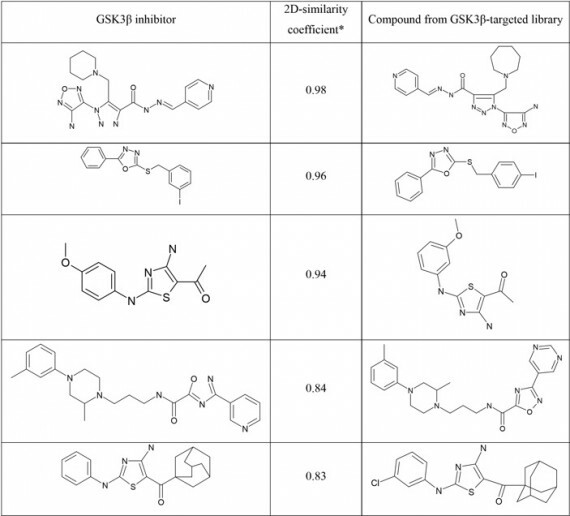 Gentile and colleagues  have discovered a novel series of 2-(4-pyridyl)-thienopyridinone GSK-3β inhibitors (Fig. 4B). X-ray crystallography reveals its binding mode and enables rationalization of the SAR. The initial optimization of the template for improved cellular activity and predicted CNS penetration is also presented. 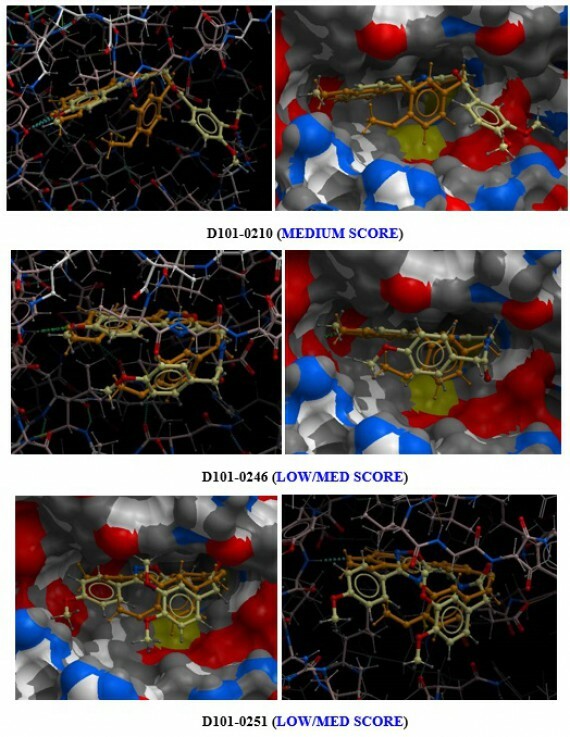 Many various computational approaches have been effectively applied for the design of novel small molecule GSK-3β inhibitors including 2D-structural similarity, bioisosteric/isosteric morphing procedures, artificial neural-net algorithms (ANN), 3D-pharmacophore modeling and searching as well as 3D-molecular docking. Several representative examples are highlight below. Caballero et al  have been performed the docking of 3-amino-1H-indazoles complexed with GSK3β to gain insight into the structural requirements and preferred conformations of these inhibitors. The study was conducted on a selected set of 57 compounds with variation in structure and activity. Authors have found that the most active compounds established three hydrogen bonds with the residues of the hinge region of GSK3β, but some of the less active compounds have other binding modes. In addition, models able to predict GSK3β inhibitory activities (IC50) of the studied compounds obtained by 3D-QSAR methods CoMFA and CoMSIA. Ligand-based and receptor-guided alignment methods have been utilized. Adequate R(2) and Q(2) values have been obtained by each method, although some striking differences existed between the obtained contour maps. Each of the predictive models exhibited a similar ability to predict the activity of a test set. The application of docking and quantitative structure-activity relationship together allowed conclusions to be drawn for the choice of suitable GSK3β inhibitors. 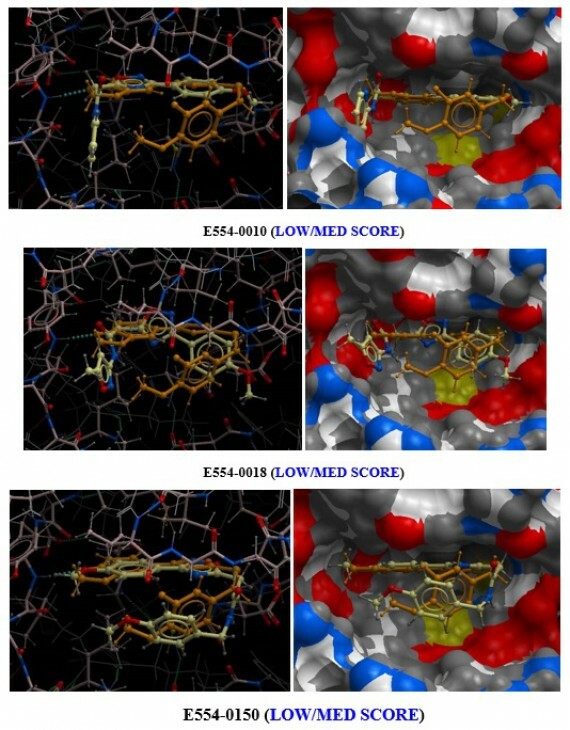 Structure-based virtual screening of GSK3β inhibitors, including the analysis of scoring functions applied to large true actives and decoy sets, have been described in . Thus, comparative assessment of nine different scoring functions (OpenEye and Tripos implementation) applied to structure-based virtual screening based on rigid docking of the pregenerated conformations library of GSK-3β inhibitors has been carried out. The functions studied belong to the following types: Gaussian (Chemgauss3, Shapegauss), empirical (Chemscore, OEChemscore, Piecewise Linear Potential, Screenscore), force field-based (D_score and G_score), and potential of mean force (PMF_score). Overall enrichment of the large true inhibitors set against the set of true non-inhibitors, Directory of Useful Decoys (DUD), cyclin-dependent kinase 2 subset, and NCI Diversity Set was evaluated by means of ROC (receiver operating characteristic) method. According to this analysis, scoring function Chemscore leads to the best enrichment of the inhibitors whereas the best early enrichment of the actives may be obtained with the help of Chemgauss3 function as estimated by BEDROC (Boltzmann-enhanced discrimination of ROC) metrics. Fang et al  have suggested a new lead identification protocol that predicts new GSK-3β ATP competitive inhibitors with topologically diverse scaffolds (Fig. 5). First, three-dimensional quantitative structure-activity relationship (3D QSAR) models were built and validated. 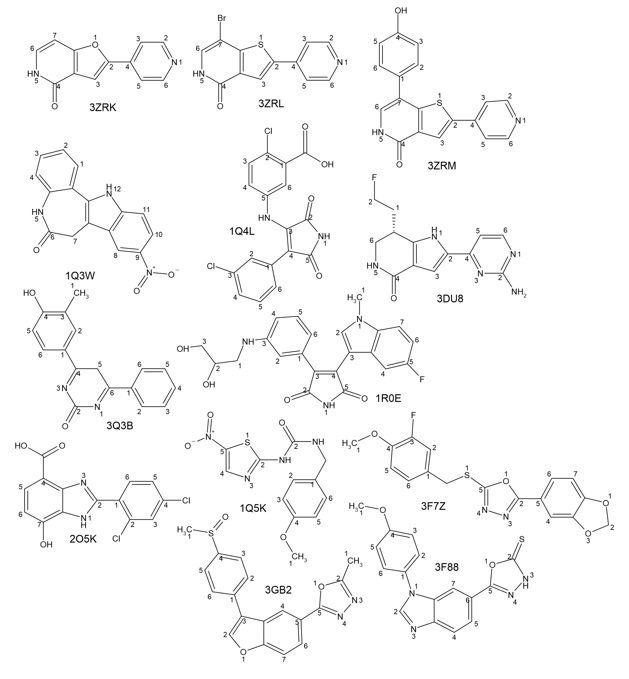 These models are based upon known GSK-3β inhibitors, benzofuran-3-yl-(indol-3-yl) maleimides, by means of comparative molecular field analysis (CoMFA) and comparative molecular similarity indices analysis (CoMSIA). 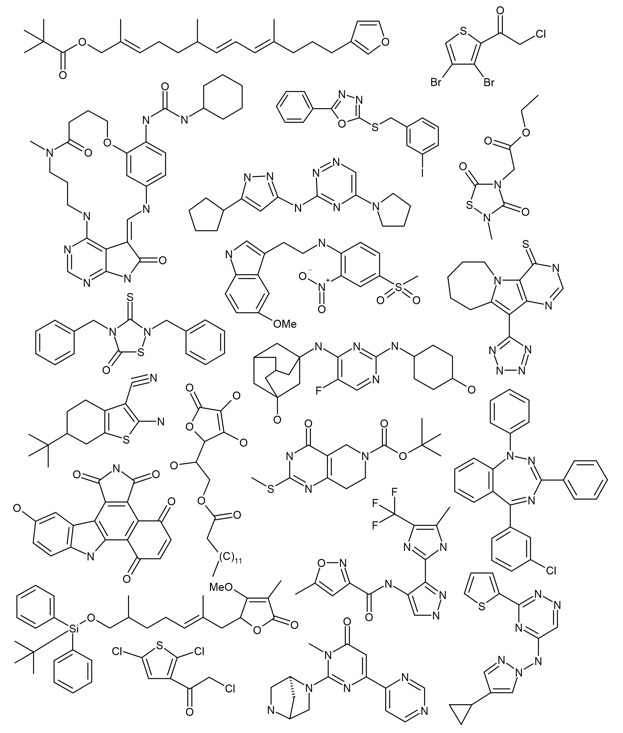 Second, 28,826 maleimide derivatives were selected from the PubChem database. After filtration via Lipinski’s rules, 10,429 maleimide derivatives were left. Third, the FlexX-dock program was employed to virtually screen the 10,429 compounds against GSK-3β. This resulted in 617 virtual hits. Fourth, the 3D QSAR models predicted that from the 617 virtual hits, 93 compounds would have GSK3β inhibition values of less than 15 nM. Finally, from the 93 predicted active hits, 23 compounds were confirmed as GSK-3β inhibitors from literatures; their GSK-3β inhibition ranged from 1.3 to 480 nM. Therefore, the hits rate of our virtual screening protocol is greater than 25%. The protocol combines ligand- and structure-based approaches and therefore validates both approaches and is capable of identifying new hits with topologically diverse scaffolds. Licht-Murava and colleagues  have explored substrate recognition and competitive inhibition of GSK3β using molecular and computational tools. In previous work, authors described Gln89 and Asn95 within GSK-3β as important substrates binding sites. In the cited work, they show that the cavity bordered by loop 89-QDKRFKN-95, located in the vicinity of the GSK-3β catalytic core, is a promiscuous substrate binding subsite. Mutations within this segment highlighted Phe93 as an additional essential contact residue for substrates’ recognition. However, unlike Gln89 and Asn95, Phe93 was also important for the binding of our previously described substrate competitive inhibitor, L803 [KEAPPAPPQS(p)P], and its cell-permeable variant L803-mts. The effects of the substitution of charged or polar residues within L803 further suggested that binding to GSK-3β is governed by hydrophobic interactions. The described computational model of GSK-3β bound to L803 was in agreement with the experimental data. It revealed L803 binding with a hydrophobic surface patch and identified interactions between Pro8 (L803) and Phe93 (GSK-3β). Computational modeling of new L803 variants predicted that inhibition would be strengthened by adding contacts with Phe93 or by increasing the hydrophobic content of the peptide. Indeed, the newly designed L803 variants showed improved inhibition. 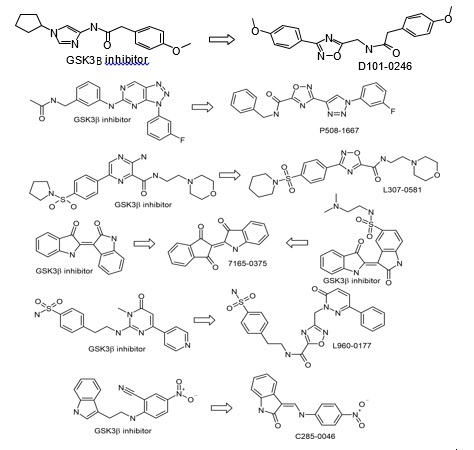 The study identified different and overlapping elements in GSK-3β substrate and inhibitor recognition and provides a novel example for model-based rational design of substrate competitive inhibitors for GSK-3. An original application of two MIFs-based tools (Volsurf+ and Pentacle) to binary QSAR, the case of a palinurin-related data set of non-ATP competitive GSK-3β inhibitors, has recently been evaluated by Ermondi et al . VolSurf+ and GRIND descriptors extract the information present in MIFs calculated by GRID; the first are simpler to interpret and generally applied to ADME-Tox topics, whereas the latter are more sophisticated and thus more suited for pharmacodynamics events. The paper describes the approach which compares binary QSAR models obtained with VolSurf+ descriptors and GRIND for a data set of non-ATP competitive GSK-3β inhibitors chemically related to palinurin for which the biological activity is expressed in binary format. Results suggest not only that the simpler Volsurf+ descriptors are good enough to predict and chemically interpret the investigated phenomenon but also a bioactive conformation of palinurin which may guide future design of ATP non-competitive GSK-3 inhibitors. docking, are based on available X-Ray data obtained for several small-molecule GSK-3β inhibitors (Fig. 6). 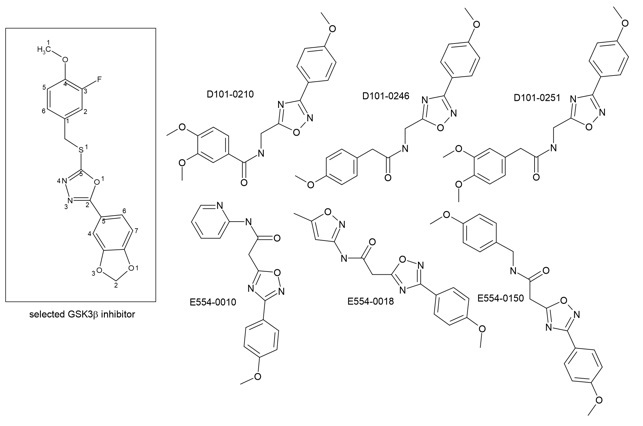 Small-molecule GSK-3β inhibitors supported by crystallographic data. 4. Computational-based `in silico` ADME/Tox assessment for novel compounds includes prediction of human CYP P450-mediated metabolism and toxicity as well as many pharmacokinetic parameters, such as Human Intestinal Absorption (HIA), Plasma Protein binding (PPB), Plasma half-life time (T1/2), Volume of distribution in human plasma (Vd), etc. exploratory small molecule chemistry for bioscreening [for related data visit ChemDiv. Inc. online source: www.chemdiv.com]. 1. High-throughput synthesis with multiple parallel library validation. Synthetic protocols, building blocks and chemical strategies are available. 2. Library activity validation via bioscreening with related SAR study. Bioisosteric transformation is one of the tools that allow to balance different lead-like papameters including specificity, physicochemical and PKPD properties in the SAR studies. In addition, bioisosteric morphing provides insight into patentability of lead candidates. Numerous GSK-3β inhibitors have been designed using this technique. We have applied this approach to design of our GSK3β-targeted library. 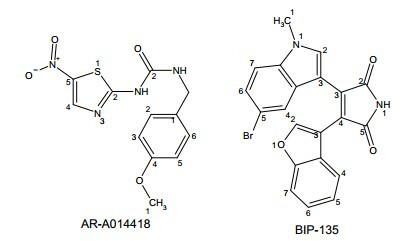 Typical examples of bioisosteric modifications for this class of molecules are shown in Fig. 7. We also have applied the typical 2D-similarity approach to select the most similar ChemDiv compounds to known GSK3β inhibitors (Table 2). 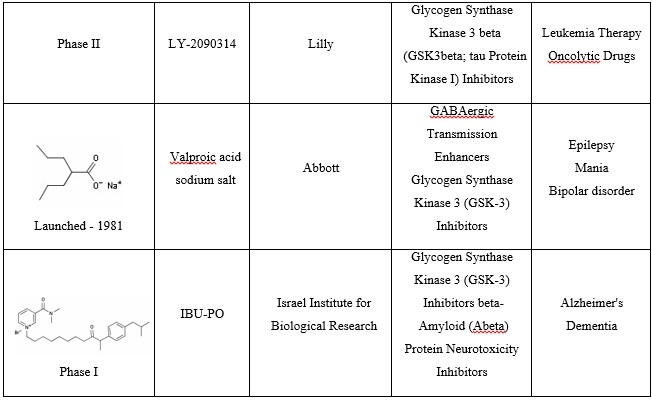 As shown in the table below, selected ChemDiv compounds have high structural similarity toward reported GSK3β inhibitors and represent promising hit-candidates against GSK3β. Heterocyclic analogues of core moieties as well as similar peripheral fragments with regard to lipophilicity and key binding points are shown. In addition, we also have applied the main concept of “Targeted Diversity” for the GSK3β-library design. Thus, we have selected a set of compounds from the common kinase library based on the fundamental principles of the underlying concept. As a result, approx. 20% of compounds within the library have been recruited following this approach. (3F7Z) for known GSK3β inhibitor (2-(1,3-benzodioxol-5-yl)-5-[(3-fluoro-4-methoxybenzyl)thio]-1,3,4oxadiazole) (see Fig. 8). This model has been used for the assessment of most represented chemotypes within the target library. 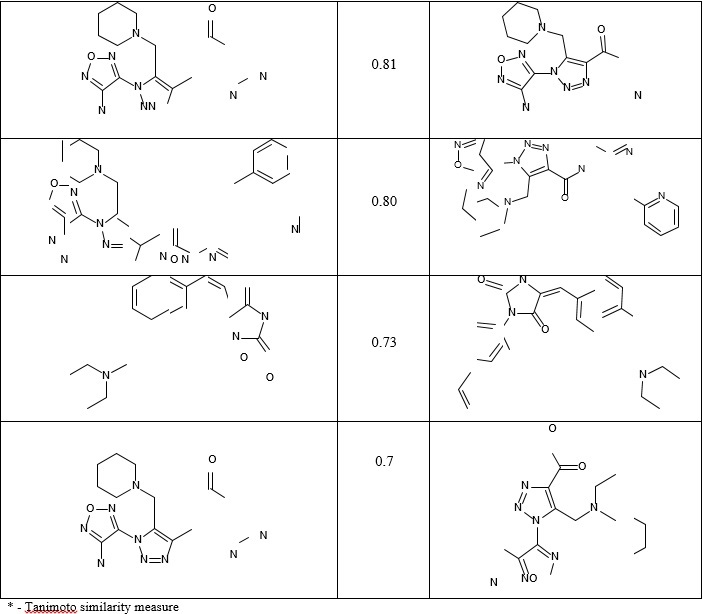 Representative examples of ChemDiv molecules with related docking score are depicted in Figs. 8 and 9. 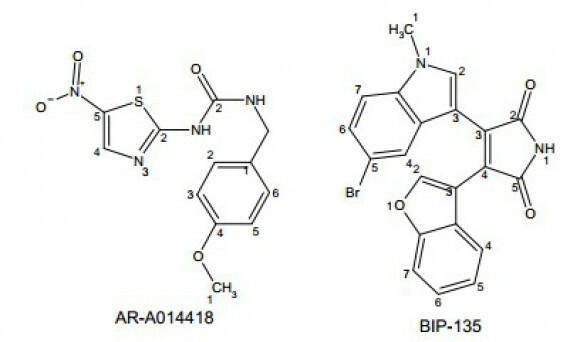 As shown in Figure 9, compounds from the target library have a similar binding mode as compared to the template molecule. 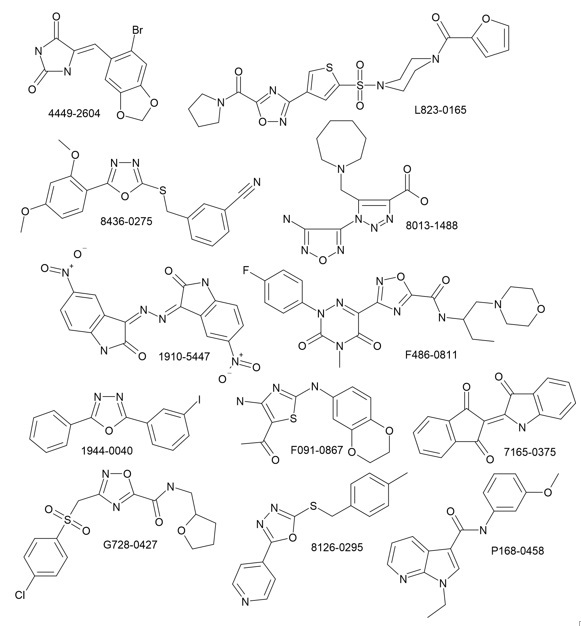 Representative examples of compounds from GSK3β-targeted library are shown in Fig. 10. The template GSK3β inhibitor and examples of docked compounds from the library. Here we provide an efficient approach for the design of novel GSK3β-active compounds. Based on the accumulated knowledgebase, concept of target diversity as well as unique structure- and target-based computational models we have designed GSK3β-targeted library of more than 4K small molecule compounds. As a result, the library is renewed each year, proprietary compounds comprising 50-75% of the entire set. Clients are invited to participate in the template selection process prior to launch of our synthetic effort. 2 Doble BW, Woodgett JR. GSK-3: tricks of the trade for a multitasking kinase. J Cell Sci. 2003;116:1175–1186; Jope RS, Johnson GV. The glamour and gloom of glycogen synthase kinase-3. Trends Biochem Sci. 2004;29:95–102; Jope RS, Yuskaitis CJ, Beurel E. Glycogen synthase kinase-3 (GSK3): inflammation, diseases, and therapeutics. Neurochem Res. 2007;32:577– 595. 7 Sugano T, Yanagita T, Yokoo H, Satoh S, Kobayashi H, Wada A. Enhancement of insulin-induced PI3K/Akt /GSK-3β and ERK signaling by neuronal nicotinic receptor/PKC-α/ERK pathway: up-regulation of IRS-1/-2 mRNA and protein in adrenal chromaffin cells. J Neurochem. 2006;98:20–33. 8 Hall AC, Brennan A, Goold RG, Cleverley K, Lucas FR, Gordon-Weeks PR, et al. Valproate regulates GSK-3-mediated axonal remodeling and synapsin I clustering in developing neurons. Mol Cell Neurosci. 2002;20:257–270; Jones DM, Tucker BA, Rahimtula M, Mearow KM. The synergistic effects of NGF and IGF-1 on neurite growth in adult sensory neurons: convergence on the PI 3-kinase signaling pathway. J Neurochem. 2003;86:1116–1128; Owen R, Gordon-weeks PR. Inhibition of glycogen synthase kinase 3β in sensory neurons in culture alters filopodia dynamics and microtubule distribution in growth cones. Mol Cell Neurosci. 2003;23:626–637; Goold RG, Gorden-weeks PR. Glycogen synthase kinase 3β and the regulation of axon growth. Biochem Soc Trans. 2004;32:809–811; Jiang H, Guo W, Liang X, Rao Y. Both the establishment and the maintenance of neuronal polarity require active mechanisms: critical roles of GSK-3β and its upstream regulators. Cell. 2005;120:123–135; Gärtner A, Huang X, Hall A. Neuronal polarity is regulated by glycogen synthase kinase-3 (GSK-3β) independently of Akt/PKB serine phosphorylation. J Cell Sci. 2006;119:3927–3934. 9 Wada A, Yokoo H, Yanagita T, Kobayashi H. New twist on neuronal insulin receptor signaling in health, disease, and therapeutics. J Pharmacol Sci. 2005;99:128–143; Wada A, Yokoo H, Yanagita T, Kobayashi H. Lithium: potential therapeutics against acute brain injuries and chronic neurodegenerative diseases. J Pharmacol Sci. 2005;99:307–321. 10 Osakada F, Ooto S, Akagi T, Mandai M, Akaike A, Takahashi M. Wnt signaling promotes regeneration in the retina of adult mammals. J Neurosci. 2007;27:4210–4219; Das AV, Mallya KB, Zhao X, Ahmad F, Bhattacharya S, Thoreson WB, et al. Neural stem cell properties of Muller glia in the mammalian retina: regulation by Notch and Wnt signaling. Dev Biol. 11 Osakada F, Ooto S, Akagi T, Mandai M, Akaike A, Takahashi M. Wnt signaling promotes regeneration in the retina of adult mammals. J Neurosci. 2007;27:4210–4219. 12 Wan J, Zheng H, Xiao HL, She ZJ, Zhou GM. Sonic hedgehog promotes stem-cell potential of Muller glia in the mammalian retina. Biochem Biophys Res Commun. 2007;363:347–354. 13 Kiselyov AS, Tkachenko SE, Balakin KV, Ivachtchenko AV. Small-molecule modulators of Hh and Wnt signaling pathways. Expert Opin Ther Targets. 2007 Aug;11(8):1087-101. 14 Nelson WJ, Nusse R. Convergence of Wnt, β-catenin, and cadherin pathways. Science. 2004;303:1483–1487; Moon RT, Bowerman B, Boutros M, Perrimon N. The promise and perils of Wnt signaling through β-catenin. Science. 2002; 296:1644– 1646; Akiyama T. Wnt/β-catenin signaling. Cytokine Growth Factor Rev. 2000;11:273–282; Mlodzik M. Planar cell polarization: do the same mechanisms regulate Drosophila tissue polarity and vertebrate gastrulation? Trends Genet. 2002;18:564–571; Kühl M, Sheldahl LC, Park M, Miller JR, Moon RT. The Wnt/Ca2+ pathway: a new vertebrate Wnt signaling pathway takes shape. Trends Genet. 2000;16:279–283; Chen AE, Ginty DD, Fan CM. Protein kinase A signalling via CREB controls myogenesis induced by Wnt proteins. Nature. 2005;433:317–322. 15 Cohen P, Frame S. The renaissance of GSK3. Nat Rev Mol Cell Biol. 2001;2:769–776; Frame S, Cohen P. GSK3 takes centre stage more than 20 years after its discovery. Biochem J. 2001;359:1–16; Cross D, Alessi DR, Cohen P, Andjelkovich M, Hemmings BA. Inhibition of glycogen synthase kinase-3 by insulin mediated by protein kinase B. Nature. 1995;378:785–789. 21 Takahashi-Yanaga F, Taba Y, Miwa Y, Kubohara Y, Watanabe Y, Hirata M, et al. Dictyostelium differentiation-inducing factor-3 activates glycogen synthase kinase-3β and degrades cyclin D1 in mammalian cells. J Biol Chem. 2003;278:9663–9670; Yasmin T, Takahashi-Yanaga F, Mori J, Miwa Y, Hirata M, Watanabe Y, et al. Differentiation-inducing factor-1 suppresses gene expression of cyclin D1 in tumor cells. Biochem Biophys Res Commun. 2005;338:903–909; Mori J, Takahashi-Yanaga F, Miwa Y, Watanabe Y, Hirata M, Morimoto S, et al. Differentiation-inducing factor-1 induces cyclin D1 degradation through the phosphorylation of Thr286 in squamous cell carcinoma. Exp Cell Res. 2005;310:426–433; Takahashi-Yanaga F, Mori J, Matsuzaki E, Watanabe Y, Hirata M, Miwa Y, et al. Involvement of GSK-3β and DYRK1B in differentiation-inducing factor-3induced phosphorylation of cyclin D1 in HeLa cells. J Biol Chem. 2006;281:38489–38497. 23 Diehl JA, Zindy F, Sherr CJ. Inhibition of cyclin D1 phosphorylation on threonine-286 prevents its rapid degradation via the ubiquitin-proteasome pathway. Genes Dev. 1997;11:957–972; Diehl JA, Cheng M, Roussel MF, Sherr CJ. Glycogen synthase kinase-3β regulates cyclin D1 proteolysis and subcellular localization. Genes Dev. 1998;12:3499–3511; Zou Y, Ewton DZ, Deng X, Mercer SE, Friedman E. Mirk/dyrk1B kinase destabilizes cyclin D1 by phosphorylation at threonine 288. J Biol Chem. 25 Mora A, Sakamoto K, McManus EJ, Alessi DR. Role of the PDK1-PKB-GSK3 pathway in regulating glycogen synthase and glucose uptake in the heart. FEBS Lett. 2005;579:3632–3638; Sugden PH, Fuller SJ, Weiss SC, Clerk A. Glycogen synthase kinase 3 (GSK3) in the heart: a point of integration in hypertrophic signalling and a therapeutic target? A critical analysis. Br J Pharmacol. 2008;153 Suppl 1:S137–S153. GJ. Opioid-induced cardioprotection occurs via glycogen synthase kinase-3β inhibition during reperfusion in intact rat hearts. Circ Res. 2004;94:960–966; Gomez L, Paillard M, Thibault H, Derumeaux G, Ovize M. Inhibition of GSK3β by postconditioning is required to prevent opening of the mitochondrial permeability transition pore during reperfusion. Circulation. 2008;117:2761–2768; Nishihara M, Miura T, Miki T, Sakamoto J, Tanno M, Kobayashi H, et al. Erythropoietin affords additional cardioprotection to preconditioned hearts by enhanced phosphorylation of glycogen synthase kinase-3β. Am J Physiol Heart Circ Physiol. 2006;291: H748–H755; Nishihara M, Miura T, Miki T, Tanno M, Yano T, Naitoh K, et al. Modulation of the mitochondrial permeability transition pore complex in GSK-3β-mediated myocardial protection. J Mol Cell Cardiol. 2007;43:564–570. 31 Watcharasit P, Bijur GN, Song L, Zhu J, Chen X, Jope RS. Glycogen synthase kinase-3β (GSK3β) binds to and promotes the actions of p53. J Biol Chem. 2003;278:48872–48879. 33 Tong H, Imahashi K, Steenbergen C, Murphy E. Phosphorylation of glycogen synthase kinase-3beta during preconditioning through a phosphatidylinositol-3-kinase–dependent pathway is cardioprotective. Circ Res. 2002;90:377–379. innate cardioprotection from ischemia-reperfusion injury. J Appl Physiol. 2007;103: 1441–1448. 35 Miki T, Miura T, Tsuchida A, Nakano A, Hasegawa T, Fukuma T, et al. Cardioprotective mechanism of ischemic preconditioning is impaired by postinfarct ventricular remodeling through angiotensin II type 1 receptor activation. Circulation. 2000;102: 458–463; Miki T, Miura T, Tanno M, Sakamoto J, Kuno A, Genda S, et al. Interruption of signal transduction between G protein and PKC-ε underlies the impaired myocardial response to ischemic preconditioning in postinfarct remodeled hearts. Mol Cell Biochem. 2003;247:185–193; Miki T, Miura T, Yano T, Takahashi A, Sakamoto J, Tanno M, et al. Alteration in erythropoietin-induced cardioprotective signaling by postinfarct ventricular remodeling. J Pharmacol Exp Ther. 38 Mol Pharmacol. 2011 Jun;79(6):974-86. Epub 2011 Mar 3. Glycogen synthase kinase-3β is a functional modulator of serotonin-1B receptors. Chen L, Zhou W, Chen PC, Gaisina I, Yang S, Li X. 39 Bioorg Med Chem Lett. 2011 Oct 1;21(19):5948-51. Synthesis and structure-activity relationship of 4-quinolone-3-carboxylic acid based inhibitors of glycogen synthase kinase-3β. Cociorva OM, Li B, Nomanbhoy T, Li Q, Nakamura A, Nakamura K, Nomura M, Okada K, Seto S, Yumoto K, Liyanage M, Zhang MC, Aban A, Leen B, Szardenings AK, Rosenblum JS, Kozarich JW, Kohno Y, Shreder KR. 40 Bioorg Med Chem Lett. 2011 Aug 15;21(16):4823-7. Identification of 2-(4- pyridyl)thienopyridinones as GSK-3β inhibitors. Gentile G, Bernasconi G, Pozzan A, Merlo G, Marzorati P, Bamborough P, Bax B, Bridges A, Brough C, Carter P, Cutler G, Neu M, Takada M.
41 Chem Biol Drug Des. 2011, 78, 631-41. Binding Studies and Quantitative Structure-Activity Relationship of 3-Amino-1HIndazoles as Inhibitors of GSK3β. Caballero J, Zilocchi S, Tiznado W, Collina S, Rossi D.
42 Chem Biol Drug Des. 2011, 78, 378-90. Structure-based virtual screening of glycogen synthase kinase 3β inhibitors: analysis of scoring functions applied to large true actives and decoy sets. Osolodkin DI, Palyulin VA, Zefirov NS. 43 J Chem Inf Model. 2011, 51, 1431-8. A new protocol for predicting novel GSK-3β ATP competitive inhibitors. Fang J, Huang D, Zhao W, Ge H, Luo HB, Xu J. 44 J Chem Inf Model. 2011, 51, 1431-8. A new protocol for predicting novel GSK-3β ATP competitive inhibitors. Fang J, Huang D, Zhao W, Ge H, Luo HB, Xu J. 45 J Mol Biol. 2011 Apr 29;408(2):366-78. Elucidating substrate and inhibitor binding sites on the surface of GSK-3β and the refinement of a competitive inhibitor. Licht-Murava A, Plotkin B, Eisenstein M, Eldar-Finkelman H.
46 Eur J Med Chem. 2011 Mar;46(3):860-9. An application of two MIFs-based tools (Volsurf+ and Pentacle) to binary QSAR: the case of a palinurin-related data set of non-ATP competitive glycogen synthase kinase 3β (GSK-3β) inhibitors. Ermondi G, Caron G, Pintos IG, Gerbaldo M, Pérez M, Pérez DI, Gándara Z, Martínez A, Gómez G, Fall Y.